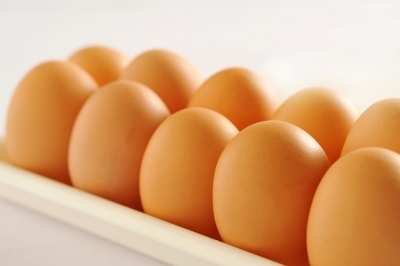 Eggs Are the New Superfood: No Yolking! For decades, eggs have been given a bum rap as unhealthful contributors to elevated cholesterol. Like shellfish, liver and a host of other animal-based foods, eggs yolks contain a relatively high volume of naturally-occurring cholesterol. Throughout the latter half of the 20th Century, medical practitioners demonized eggs as unhealthful precursors to heart disease. However, recent research has shown that our bodies need cholesterol to perform numerous metabolic processes, and that animal fats containing cholesterol have never been proven to cause heart disease. Because of the negative publicity maligning egg yolks, many health-conscious people began shunning the yolk and just eating the tasteless egg white, called albumin. Egg whites are one of the easiest protein sources for your body to metabolize, and the albumin of one egg offers 3.6 grams of easily digested protein. Because of the trend away from whole eggs, many restaurants like Panera and Starbucks began offering sandwiches and omelets made from egg whites only. Contrary to the bland albumin, the yolk is what gives an egg its delicious flavor. While egg yolks have relatively high levels of cholesterol and saturated fat (also recently welcomed back to the healthful foods family), they are a rich source of essential nutrients. 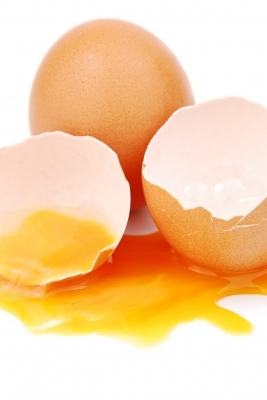 Egg yolks are high in sulfur which promotes healthy liver function and healthy skin, hair and nails. 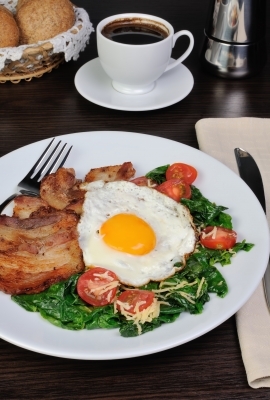 Yolks contain significant amounts of lutein, essential to good vision. Egg yolks are high in B-vitamins and in choline, which your body uses to make “happy hormones” like serotonin, dopamine, and norepinephrine. They are also a great source of fat soluble vitamins A, D, E and K.
Before you rush out to grab your next dozen, be aware that not all eggs are created equal. As with all animal products, the best food comes from the healthiest and most humanely treated animals. Pastured free range hens feast on grass, weed seeds, insects and worms, and produce superior eggs to those laid by hens held captive in Confined Animal Feeding Operations, or CAFOs. CAFO hens are fed processed feed containing antibiotics, arsenic and other harmful chemicals and ingredients, resulting in a less nutritious and potentially harmful egg. 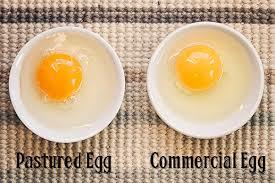 A pastured egg typically has a bright orange yolk and a thicker shell than a pale-yolked CAFO egg. Even at five dollars per dozen, the nutrition-packed free range egg is a bargain at just 42 cents per egg. Nutrition knowledge is fundamental to good health, physical performance and weight management. Yet much of the information we hear about nutrition can be misleading and confusing. W.I.T.S. offers nutrition courses that can lay the foundation for your healthy lifestyle journey. Enroll in the Nutrition Bundle Special course to enhance your knowledge and understanding of this important topic. Farm Sanctuary: Chickens Used for Eggs. Next post: What Are GMOs, And Why Should You Care?